Selma (left) and Arthur Härtel carry the lantern to lead the way for children's church at the United Methodist Church of the Redeemer in Munich, Germany. Editor’s note: This is the 10th in an occasional series of stories, “German Methodism: A strong Christian voice,” about the 51,000-member United Methodist Church in Germany. Sunlight streams through modern stained-glass windows as a band that includes the lay pastor on guitar leads the congregation in singing hymns. Arthur Härtel, 4, proudly lifts a lantern and leads a group of more than 20 children out of the main sanctuary for children’s church. Erlöserkirche-München, or United Methodist Church of the Redeemer, is a thriving German congregation in a new building that also houses a Farsi-speaking congregation of immigrants. In addition to the two United Methodist congregations, the church rents space to other congregations and a nursery school. There is an indoor playground, a music school, taekwondo and ballet classes, to name a few of the activities that bring 500 to 600 people to the church building each week. Families gather for worship at the United Methodist Church of the Redeemer in Munich. Most of the members credit the previous pastor, the Rev. Friedemann Burkhardt, with emphasizing children’s programs that attracted young families and got people involved. Verena Rahn, a mother of two, said it’s uncommon for German churches to have a lot of children — the main reason her family attends. “The work with the children is excellent,” said Rahn, who was unchurched before finding this congregation. Church leaders and parishioners pray together during worship at the United Methodist Church of the Redeemer in Munich. She said there are sometimes more than 50 children in church and that the youth program is quite active. The church also has a personal touch, she said. “They are really thinking of us. We have people who go visit the old people and we livestream the sermons so that people who are sick or traveling or shut-in can watch,” Rahn said. Ruth Duppel, who grew up United Methodist, agreed. She attended the other United Methodist Church in Munich, but began driving 40 kilometers to Bezirk when her twin sons were 3 years old and her daughter was 1. Parishioners sing during worship at the United Methodist Church of the Redeemer in Munich. Franziska Wild volunteers with the children's ministry at the United Methodist Church of the Redeemer in Munich. Now, the 14-year-old twins, Manuel and Simon, and 11-year-old Miriam play in the youth band and take part in youth group. “They know that next Sunday, my friends will be here,” she said. And the family attends a house group during the week in their own neighborhood for Bible readings and community. 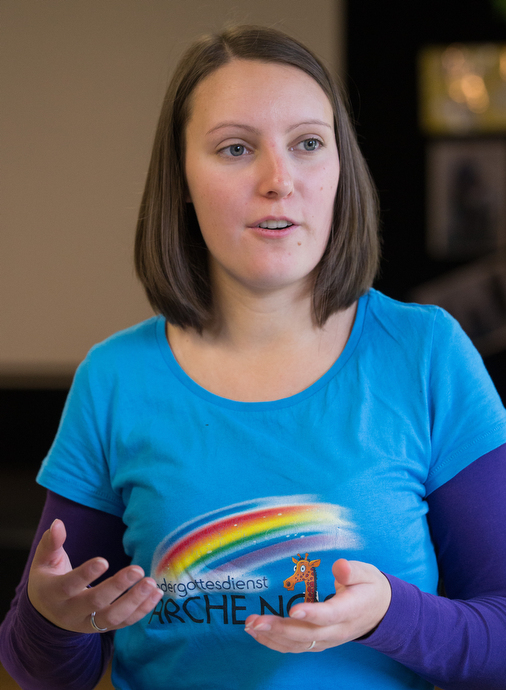 Franziska Wild, a college student who volunteers for children’s programs, wears a Noah’s Ark shirt that she said most of the volunteers who help with children wear to be easily recognizable. “I’ve been here since I was a baby. We not only take care of the children, we do programs so that they can learn many different things. So they can hear the stories of God and Jesus,” Wild said. Agnes Mensching, another volunteer who is also a teacher, said the church has programs for children of all ages and that volunteers share the love of God with the children. “The children find they are welcome and the parents really appreciate it,” she said. Högg agreed that the church offers a personal touch and credits the former pastor for setting that tone. “He saw people on the edge and the outside and recognized them and integrated them,” Högg said. Children play outside after worship at the United Methodist Church of the Redeemer in Munich. On a sunny Sunday last September, Högg made a point of talking to everyone who attended as they left church. “The big challenge is to see them and keep them in the congregation,” he said. He and others aren’t worried that their new pastor won’t be able to come until his daughter finishes school in 2018 — instead, they see an opportunity for people to step up to lead and try new things. Lay pastor Brigit Hofheinz gives the sermon during worship at the United Methodist Church of the Redeemer in Munich. In Munich (München in German), which is in the region of Bavaria, there are two United Methodist churches. “I would love for the United Methodists to have a vision for the church,” Högg said. In Bavaria, he said, people don’t know The United Methodist Church. But Alexander Badstübner, who moved from then-East Germany in 1997, said he has been a United Methodist all his life and he looks to the local congregation. Some 150 people worship at the United Methodist Church of the Redeemer in Munich on most Sundays. “We have to learn for the church that the point of contact is the local congregation. The way we learn about the people around us, what they are looking for and what we can give them. That’s how we bring them to Christ,” he said. He, too, believes the church will be fine with a team leadership for nearly a year. “The former pastor was strong and that was very good for this congregation. He had new ways and new views. Now we can explore. He created an organization that is carrying on by itself,” he said. While the church was founded before World War II, it only affiliated with the Methodist Church because under the Nazi regime a church had to be affiliated with a denomination, Hogg said. “But they weren’t really Methodists and at the end of the 1990s, there were some problems. In 2002, there was a separation and we started with 25 or 30 people,” he said. Now, the average attendance is 150-160, including about 40 children. Brigit Hofheinz, the lay pastor who is on staff half time until the new pastor arrives, is grateful that she was available to serve the church. “I think it’s the way God has planned this year. It hasn’t just happened, it’s his plan,” she said. She believes many volunteers will rise to the occasion. “I have the gifts that are needed now, but I always see that I’m just one tool to help people get in a position and do the work God is calling them to do. I love to be the mentor and the coach and see what God is awakening,” she said. Hofheinz believes the church has a special job to be in a transitional neighborhood that has many families, including many single parents. And that role is partly to say that the church is not dying. “We are called to be the light, help us to praise, to teach members so that they can grow and that they are all worthy. We need everybody who is here to do the work of God,” she said. A parishioner arrives for worship at the United Methodist Church of the Redeemer in Munich. United Methodist relief and development agency assists vulnerable populations with emergency needs but also focuses on preparedness and sustainability projects. With 40 countries represented and five languages spoken, translators play an important role at United Methodist gathering.